Once both parties have agreed to marry they must meet with the woman’s parents to discuss the dowry. Often this is done with the help of a third party from the man’s party. This person is often a trusted elder person, friend or someone know to both the woman’s and the man’s family. In Thai society, the man and woman will find a suitor who is honourable and/or a person that they respect to be เถ้าแก่/tâogεε/. Often negotiation of the dowry can be a tricky business but it is generally based upon what value the woman can bring to the man and the man’s family, so education, age and the woman’s own net worth need to be taken into account. It is also based on what is known to have been given in the past for brides and importantly what the husband can afford. The date of the wedding is discussed with monks who use a lunar calendar and the birth dates of the bride and groom to locate a lucky date. – Man side: they will have ขบวนขันหมาก/kàbuankǎnmaàk/ which is the procession to go to ask the woman to be a bride at the woman’s home. The procession can be a procession of cars, trucks, walking sometimes even with elephants often with music, long drums and wailing. 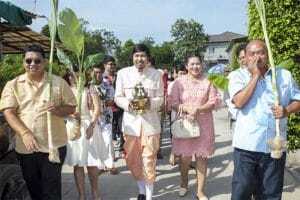 In the procession itself going to the wedding place, guests of the groom carry banana plants, rice and desserts signifying food, the dowry presented on a tray. – Woman side: they will ‘gather people and wait to welcome the wedding party ขบวนขันหมาก/kàbuankǎnmaàk/. The ceremony itself will be taken by 9 monks for good luck. 9 is a lucky Buddhist number. The wedding ceremony is very important for Buddhists. The purpose of this ceremony is to wish the bridal couple a happy life. The betrothed couple will light incense and candles and pray, then monks will give the readings and after that, the monks will bless water for the ceremony. Once the couple have given food and offerings to the monks the monks will pray and sprinkle holy water to bring luck to the couple. Thais like to have betrothal and wedding ceremony on the same day so will arrange ขันหมากหมั้น/kǎnmaàkmán/ procession and ขันหมากแต่ง/kǎnmaàkdtεεng/ procession altogether. At the beginning of the procession, there will have long drum players to play fun music. 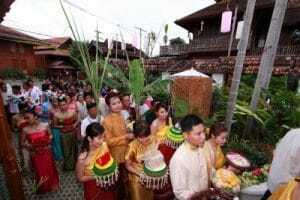 During this process, the bride will wait at home and the procession will make it’s way slowly to her. When the procession has arrived at the bride’s house. 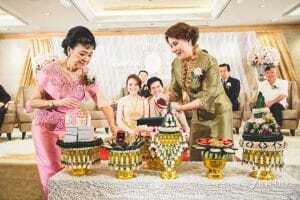 the bride’s parents will welcome the groom’s party with the girl who holds betel nut trays. The girls will wash the feet of the groom before entering the marriage location. 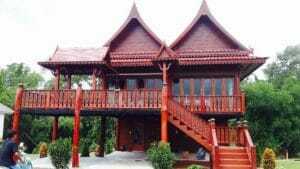 When the procession wants to enter to the house, they have to pass 3 gates which are ประตูนาก/pràdtuu naâk/, ประตูเงิน/pràdtuu ngӘn/ and also ประตูทอง/pràdtuu tͻͻng/. At each gate, the groom is asked a question and has to answer correctly in order to pass through. Often the groom will bring money envelopes to help pass the gates. In practice, this event takes place at the entrance of the wedding venue after to procession to the venue. 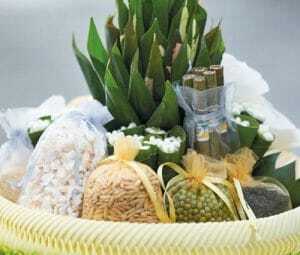 When the brides family accepts the procession of the groom they will place the items from the procession in the marriage venue and then the groom’s เถ้าแก่/tâogεε/ will ask for the woman. 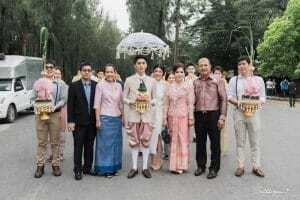 After the woman’s parents agree, the เถ้าแก่/tâogεε/ will open พานสินสอด/paansǐnsͻͻt/ (dowry tray)and this is the beginning of พิธีนับสินสอด/pítii nápsǐnsͻͻt/. The money will be placed on the red or gold fabric and displayed for all to see. The bride’s parents will count a little for effect. Once finished counting the dowry both parents of the groom and the bride will spread beans, sesame, paddy, popped rice, flower, silver and gold leaves on the dowry after that mother of the bride will wrap the dowry with fabric and carry the dowry on her shoulders. 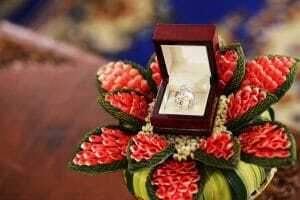 Ring exchange – after พิธีนับสินสอด/pitii nápsǐnsͻͻt/ the time is reached to exchange rings. 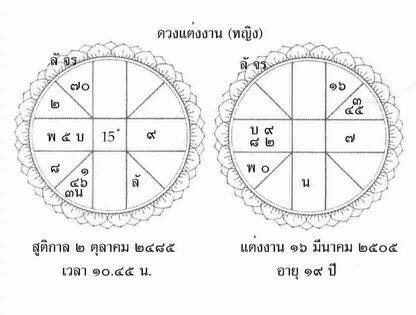 This process begins with bride pair lite the incense and candles and sit on the stool พิธีรดน้ำสังข์/pítii rótnaámsǎng/. The bride will always sit on the left. The MC or person organising the event will give the happy couple garlands. This is the last part of the process known as sending wedding couple to the bridal house. The wedding couple will wait in front of the room. The parents of the bride and groom will make their bed before inviting the newly wedded couple into the room. Everyone has to dress up well. The bride and groom’s family prepare the pillows in the bed and then place things on the bed. 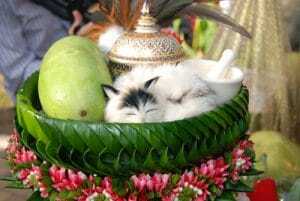 Crushed stone, green gourd, old male cat, water bowl and a tray with has some rice and mung beans on it. After inviting the happy couple to their prepared room. The family retire and join a party with the wedding guests.